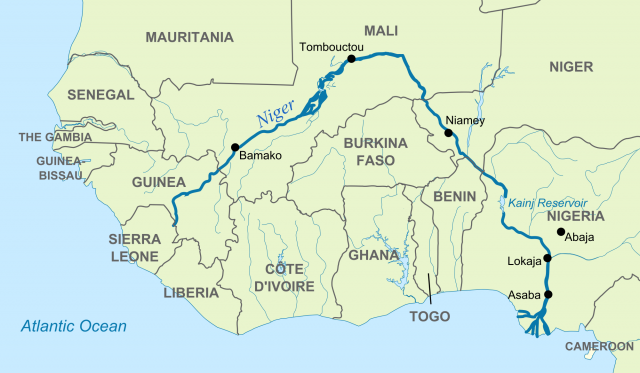 The Niger River flows in a great arc through West Africa. The continent’s third longest river, after the NILE RIVER and CONGO RIVER, it has carried travelers, traders, and explorers for hundreds of years. The Niger still serves as a highway for people and goods, but it also supplies water for agriculture and hydroelectric power. The delta at the river’s mouth in NIGERIA was an early center of European trade and now yields oil and natural gas. The Niger River is navigable for most of its 2,585 miles. Its source lies in the Kouranko Mountains on the border between SIERRA LEONE and GUINEA. Although the Atlantic Ocean is just 200 miles west of that source, the shape of the land makes the river flow east and north for a long distance before finally turning south toward the Atlantic. Along the way the Niger passes through Guinea, MALI, NIGER, the northern edge of BÉNIN, and Nigeria. Descending from the Guinea highlands into Mali, the river broadens and moves slowly. Two major tributaries, the Sankarani and Bani Rivers, join the Niger in Mali and add to its flow. Entering a flat plain, the Niger then branches out into a network of waterways called the Inland Delta. During the rainy season, which begins in late August, these channels overflow their banks and form a shallow lake 150 miles wide and 300 miles long. This yearly flood deposits fertile soil, making the inland delta an ideal agricultural zone. In especially wet years a branch of the river reaches the city of TIMBUKTU, seven miles from the river’s main channel. The Niger curves to the south at Kabara in Mali and narrows as it passes through a gorge. Flowing through Nigeria it receives another major tributary, the Benue. The river empties into the Atlantic Ocean after passing through a sprawling delta created by soil deposits from the river. Over thousands of years, the Niger has extended this delta out into the Atlantic. Long used for communication and commerce, the Niger River has played an important role in the history of West Africa. It contributed to the rise of the SUDANIC EMPIRES OF WESTERN AFRICA and later offered Europeans a route into the interior. During the period of the Songhai Empire in the 1400s and 1500s, large canoes carried grain downstream from the Inland Delta to the cities of Timbuktu and Gao. Military and court officials traveled from one end of the empire to the other on the river. The river helped make Timbuktu a busy and prosperous trade center, where the caravan routes that crossed the SAHARA DESERT connected with the Niger’s river traffic. Beginning in the late 1400s, the Ijo people of the Niger Delta formed various city-states that became the focus of European trade. However, archaeological evidence—including pottery and copper bracelets once used as money—shows that the delta peoples were involved in long-distance trade with the interior well before the Europeans arrived. European knowledge of the Niger River began with Arab maps of the Middle Ages, which mistakenly suggested a link between the Nile and the Niger Rivers. The maps also indicated that the Niger began in what is now CHAD and flowed west. Scottish explorer Mungo Park disproved this notion in 1796 when he traced part of the river’s course. By 1830 Europeans had mapped the full course of the Niger and knew that it emptied into the Atlantic through the Nigerian delta. European explorers, missionaries, and merchants—mostly British—advanced up the Niger River from the sea to trade and establish settlements. Their expeditions paved the way for the Royal Niger Company, founded in 1886, which not only gained control of European trade along the lower Niger but also expanded Britain’s political and military power in the region. British rule of Nigeria soon followed. Meanwhile, far upstream, the French moved east along the river from their colony in SENEGAL, and took over Guinea, Mali, and Niger. Many diverse ethnic groups live along the Niger and in its delta. The largest are the BAMBARA and Songhai in Mali, the Jerma in Niger, the Nupe in central Nigeria, the IGBO (Ibo) in southern Nigeria, and the Ijo (Ijaw) in the Niger Delta. The Niger River is central to the way of life of a number of these peoples, including the Sorko, a Songhai-speaking group that travels along the river from Nigeria to the Inland Delta, fishing and hunting hippopotamus.